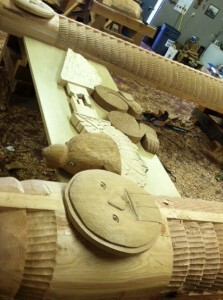 Link: Bartow carves a notch in D.C.
Not too long ago I visited Oregon artist Rick Bartow at his Newport studio and got the lowdown on his latest big project: a pair of 20-foot-tall pole carvings, depicting Raven and Grandmother Bear, that will be installed September 21st outside the National Museum of the American Indian on the National Mall, just about a block from the White House. Public commissions don’t come a lot more public than this. On Friday night I published an essay about it, In the studio: Rick Bartow carves a spot on the National Mall, at Oregon ArtsWatch. Bartow talked about teamwork, community, the value of rolling with the punches, what engineering’s got to do with it, why the carvings are NOT totem poles, and a lot of other stuff. For good measure, he and his folk/blues band, Rick Bartow and the Back Seat Drivers, provided the soundtrack for a Newport Saturday Night. The project’s gone remarkably well, if you discount the numerous design changes, the struggles to align art with engineering for the permanent installation, the steep learning curve, and the occasional flareup of vision problems from Bartow’s unexpected stroke about a year and a half ago. Originally each pole was to feature a big glass disc – sun on one, moon on the other – designed by Bartow’s partner, glass artist Nancy Blair. That changed when Corning Glass scientists looked the plans over and declared that at some point the constant stress of sun, rain and wind would cause the discs to burst. Government engineers, not surprisingly, blanched at the prospect of glass showering over tourists on the mall below.